Last season, Skingraft presented us with the goth look, but for the springtime, Jonny Cota “Designer“ has lighten things up for us, in a sense anyhow. Last season the line consisted of mainly all black looks, but he tried something different for Spring appeasing the crowd with a mere hint of spring time with hints of whites, and accents of red on a few ensembles. Santa Sangre which means “Holy Blood” Spring/Summer 2015 was the inspiration for the collection. Cota partnered with Jordan Eagles, a “blood artist,” to create prints that portray the “lighter mystical side” of the brand. 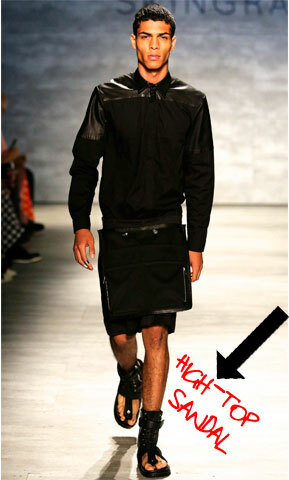 Skingraft knows how to keep close to their esthetic. Keeping leather as a main ingredient in their line up we all noticed a switch; however they didn’t stray away too far. The collection consists of looks you want, and hope to expect from Skingraft. Crafty leather looks, and this season they popped out a few surprises with my favorite surprise being the metallic pants that graced the runway; that look is easily one of my favorites the smokey button up with the crisp white sandals brought the whole look together. There was something exciting and up beat about this show, but isn’t always? The music went perfectly with the theme, and the models strutted to the beat which was fairly fast paced which kept everyone on their p’s & q’s with their cameras. Jonny offered us a great line of footwear during this show as well obviously the high-top sandal for men is in right now, but not just any high-top sandal they need to be quilted giving it a more masculine feel sort of like a boxer. I couldn’t catch a photo of that specific sandal so here it is on model “Geron McKinley” with a little help from me adding the arrow and wording just incase. When looking through the collection you go “love that, want that, need that, like that” which is a great feeling to know you thoroughly enjoy a collection, and don’t have any reservations about it. 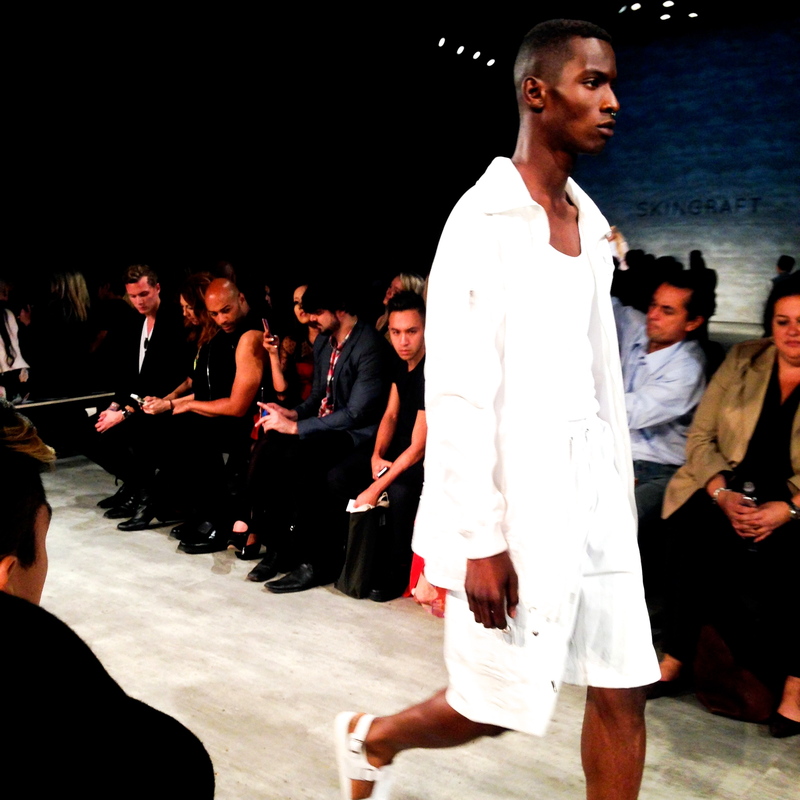 Catch a glimpse of my favorite looks from SKINGRAFT Spring 2015 Collection below. but where can I find geron at though?